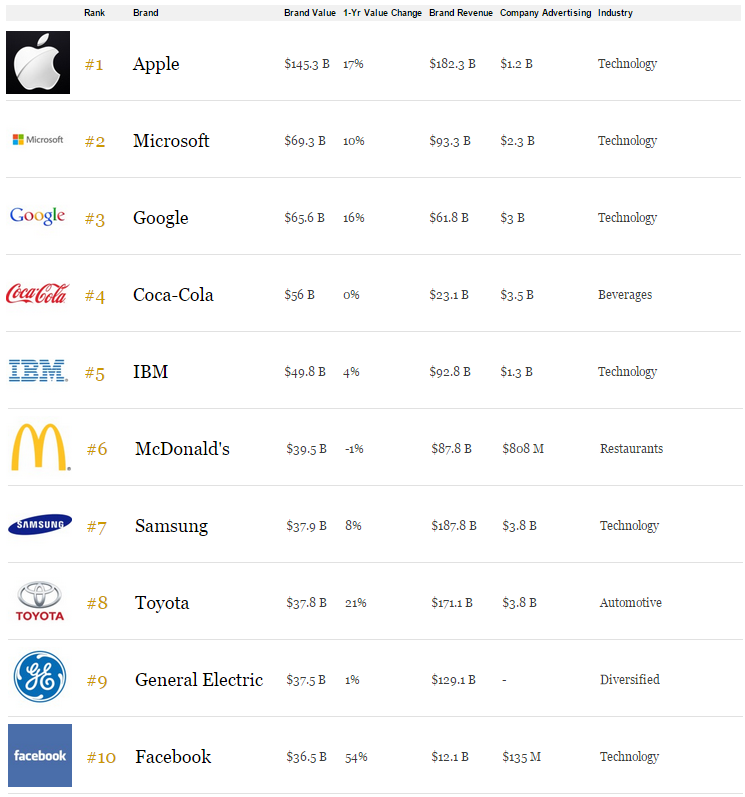 Forbes has come up with the World’s Most Valuable Brands List for 2015. Instead of focusing on the consumer behaviors and surveys, the staff at Forbes has evaluated the rankings of how valuable each brand is by inspecting the financial numbers. Apple at the lead for the fifth time, followed by Microsoft and at third position Google. Apple, as a brand is now being valued at $145.3 billion. Microsoft, on the other hand is worth $69.3 billion and has risen by 10% in value from last year. With its HoloLens project, acquisition of Nokia, and the new CEO Satya Nadella, the Company aims to not just be chosen but to be loved for its Windows offerings. Facebook has managed to make it to the top ten contenders in the list, emerging as a direct competitor to YouTube in terms of video broadcasting and viewing options. Most of the brands that are found on the list are mainly Tech-based, followed by Automotive and consumer packaged goods brands. Global restaurant franchises rank with McDonalds at number 6, StarBucks at number 52 and Subway at number 83. Retail Brands that made the cut include Wal-Mart, H&M, Home Depot, IKEA, Zara and Target. It was imperative to be operating, on a large scale in the U.S. in order to make the cut which is why China Mobile, the World’s largest mobile phone provider and Vodaphone, one of the biggest telecom providing companies could not make the cut. Disney and LEGO are Leisure Brands found in the list. The top-ranked luxury brands include Louis Vitton, Gucci, Hermes and Cartier. There is an aggregate of 9 German brands, 7 Japanese and 7 French brands and the rest of them being U.S based.